UPS Airlines, the aviation arm of United Parcel Service which is headquartered in Atlanta, Georgia, is well known for its many main and secondary hubs situated around the world. The company is no stranger to investments and has successfully built a gigantic worldwide operation over the past decade. Investments were made in North America, the Far East and Central Europe. Now the United Kingdom is to get a boost. The carrier has disclosed lately that it will invest a total of around US$158 million in erecting a brand new logistics hub at East Midlands Airport in order to speedily expand its business within the UK. East Midlands is basically a “stone’s throw” from London and not far from industrial areas such as Leicester and Derby. The local authorities at East Midlands have welcomed the UPS’s plans and already granted them a permit to build the new facility. This is not a new location for UPS. The Louisville, Kentucky-based carrier has been there for some time and employs almost 500 staff. Not that many compared to their large hubs in places such as Cologne, Hong Kong and Shanghai. This it seems is going to change. The new air cargo handling facility is reported to have 115,000 sqm of space and in order to run it UPS plans to employ more than 1,000 staff on top of what they already have there at present. The plan is to include a fully automated delivery and sortation building of 44,000 sqm in the complex as well as warehouse space for the inbound and outbound handling of general cargo. Also included is office space for UPS staff totaling 2,600 sqm. UPS Airlines is not alone at East Midlands Airport. 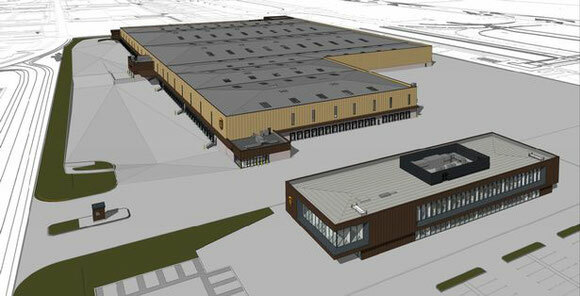 Both FedEx and DHL have premises there, but this new facility will top all of them. The completion date has still to be revealed. Whereas many all-cargo airlines are moving away from four engined freighters such as the B747 in favour of twin engined B777 and A330 freighters; UPS it seems is putting their cards for future expansion on the B747-8 freighter. They presently operate a fleet of 242 aircraft, of which so far only 17 are Boeing 747Fs (thirteen -400Fs and four-8Fs). However, they surprised the aviation experts by ordering a further 14 B747-8Fs from Boeing on top of the 14 they’d already reserved. So far four of this type are in service and the remains 24 will join the UPS fleet over the next few years. It would seem that UPS Airlines is gearing itself fast for the expanding e-commerce traffic and is convinced that the B747-8F is the right aircraft for them on long-haul Pacific and European routes. They still, and probably will continue to utilise their large fleets of A330Fs, B757Fs and B767Fs for continental U.S. and Middle America traffic. The B747-8F and the MD-11F (if kept in service), will take care of the rest. The present UPS B747F fleet recorded a 15% increase in international shipments carried last year. Compared to the B747-400 freighter, the-8 version is far more economic, carrying up to 140 tons which is almost 20% more than the older sister. Fuel burn is said to be 16% less and loadable cargo volume is also 16% higher. Adding a brand new larger facility in the UK is seen by UPS as a step in the right direction if they want to cash in on time on the e-commerce market trend. The B747-8F will surely be a regular visitor there. UPS Airlines Global Strategy is hence confusing and still left many chances unused. Even after the Fedex TNT Acquisition UPS does not seem too much engaged in increasing capacities and developing new product/delivery lines. Actually UPS Wideboy Longhaul fleet is more or less exactly half as big as Fedex´ is. Opening a new UK hub may enhance the handling of express and cargo between the UK and the USA but is irrelevant in terms of the rest of their global business. In so far I still miss significant action to widen their Americas, Europe and Asian Business. In the last years very little capacity upgrades have been seen here, so UPS remains in real danger of becoming just secondary if no action is taken now ! Thats exactly what I think ! Even TNT moves almost 80% of UPS CGN volumes at LGG. And TNT is much smaller than UPS. Africa ist still nearly a white paper for UPS. The smallest cooperation with TUN based Express Cargo Air is absolutely inessential ! By now Express Cargo Air should have operated a fleet of around 10-15 aircraft to connect into Africas important destinations. UPS itsself does not operate any regular flights to Africa ! Whereas Airlines like Turkish Airlines have already discovered the huge market opportunities years ago. After the FEXED / TNT merge and Fexed announcement to invest nearly 1 BILLION USD in the next years into their CDG hub, urgent action should have been taken by UPS, whose flights are also much more frequently delayed than Fedex ones.